If somebody was to say to you “I want you to find me somewhere to get married in rural England, steeped in history, beauty and elegance, with extensive pretty gardens, magnificent views, the possibility of an outdoor ceremony in a water garden, and a huge pond”, you’d probably think that was an awfully tall order. Well, let me introduce you to Dan and Alice’s quintessential, and absolutely stunning outdoor ceremony at Cadhay, in rural Devon. Cadhay was built in 1550 and is an historic Tudor Manor House full to the brim with tales of past custodians, nestled amongst the prettiest of gardens. Oh, and it’s got a huge pond, too. 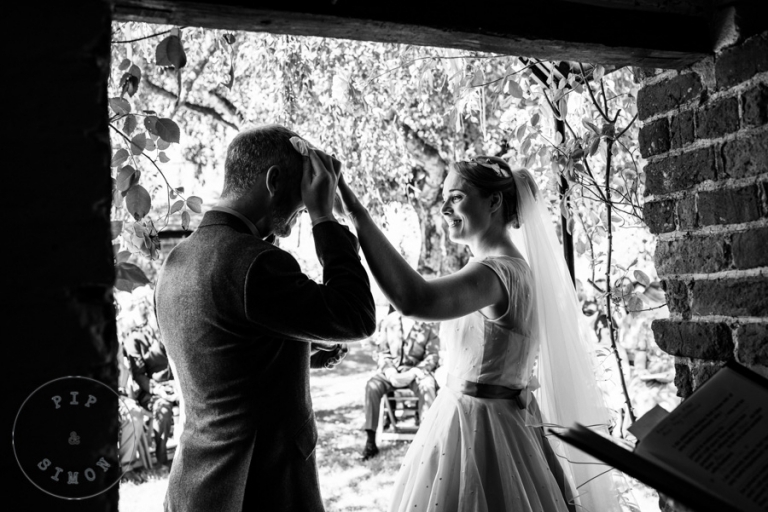 The skies were a striking blue and the sun was hot, as Dan and Alice said their vows under a rose arch in full bloom, in the water garden, with their guests enjoying the folk music played by close friends. A brilliant rendition of Taylor Swift’s ‘Love Story’ was played and sung by a friend who predeeded his performance with “I’m not a 19 year old girl, so I feel I ought to apologise to you for this…OK, here goes…” Haha! Needless to say, he smashed it. Sorry Taylor. The sun continued to shine as we took a stroll around the gardens with the happy couple, before more impromptu music played by the guests during the very funny speeches, a first dance fit for its manor house setting and of course, all rounded off with a good old tug of war, long after the sun had set. and how we approach wedding photography.